Welcome to Caribou Cabins' home on the net. Located in the heart of snowmobile country in Aroostook County, Maine. We are located right on ITS83, part of the 1600 miles of interconnecting trail system. A place for all seasons, snowmobile, ski in winter, fish and hunt in spring, ride an ATV in the summer or come for the beautiful fall foliage. In the smaller bedroom there is a queen sized bed and the larger bedroom there is a two bunk unit with twin sized beds. In the larger bedroom there is a queen sized bed and in the smaller bedroom there is a bunk unit with a full sized bed on the bottom and a twin sized on the top. This is our larger cabin with one bedroom having a queen sized bed and the other bedroom has 2 twin beds. Cabin IV is not available between June and September. 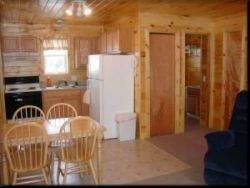 NOTE: Each cabin has a rustic pine interior, but with all the comfort and convenience of a modern cabin. 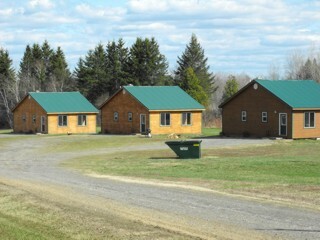 The cabins are heated with forced hot air heat. All linens, blankets, pillows and towels are provided for the length of your stay, along with bath tissue and dish soap. We require 1/3 of your rental rate to confirm your reservation withthe balance to paid in full at your time of arrival. We accept cash, money orders or credit card (Mastercard and Visa Only). Personal checks must arrive 2 weeks prior to your stay. Cancellation Policy: Prior to 30 days you will receive your deposit back less $20.00. Less than 30 days and/or early departures are non-refundable. During snowmobile season, cancellations due to snow conditions your deposit will be credited for your next stay.